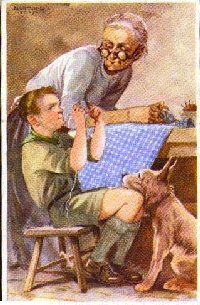 Márton Lajos (Louis Márton) was a Hungarian Scout artist who is known for his artwork on Scout post cards of the 1920s and 30s. His postcards came to worldwide attention during the Fourth World Jamboree, which was held in Hungary in 1933. It has been estimated that he produced over 200 different designs for Scout postcards. However almost no other information is known about him. Artists were a prominent and important factor in communications for the Scout movement. 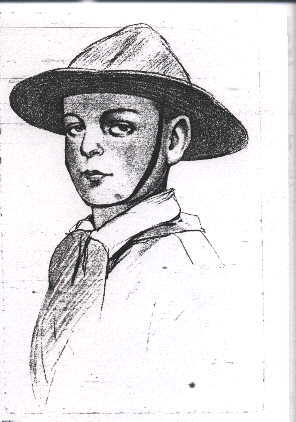 The founder, Baden-Powell as an enterprising young British military officer, illustrated with sketches the books he wrote for soldiers. In his second profession, as organizer of the Scout movement, he used sketches of both camp and morality scenes to reinforce the written words in his books. Many collectors prized as mementos B-P's correspondence, which usually contained little, sketches illustrating what he was writing about. The Baden-Powells' Christmas cards always featured a sketch relevant to the current life activities. Americans have had a love affair with their Norman Rockwell who produced large size paintings, which were annually reproduced on calendars. 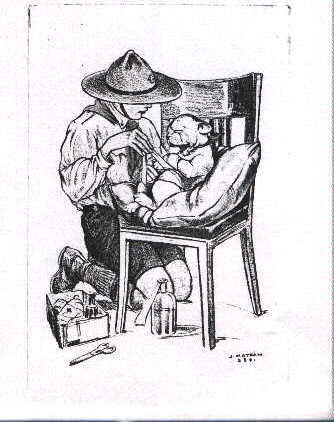 Most national Scout organizations used artists to illustrate their handbooks. 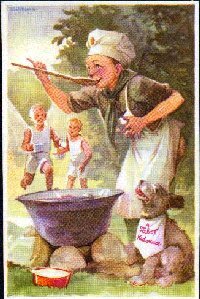 And of course the Hungarians had "Martonkaj" ("Little Márton") who sketched colorful camp scenes for the back of his postcards. 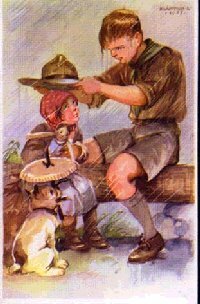 However none of the many other scout picture cards comes close to the spirit of Scouting that Márton captured on his cards. They are truly, a thing of beauty. 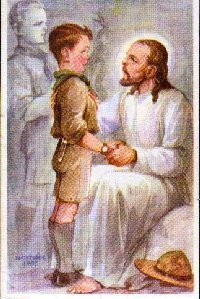 Many say that the faces of his Scouts are angelic. The first mention of Márton in a Scouts on stamp publication was in an article on the Fourth World Jamboree in the Journal of the Scouts on Stamps Society International, April 1967 issue. Little has been documented in our philatelic publications about Márton except for an occasional photo or two of his cards. Sheldon S. Levy, Kenneth A. Shuker, Barry Mann, and Doctor (Samuel) Gershenfeld were great collectors of Márton cards in the 1970s and 80s. I can remember viewing their stock books full with Márton cards. In later years, I have been able to enjoy viewing parts of John P. Ineson's collection. Another current collector of Márton cards is Wilhelm-Otto Neuback. American SOSSI members assumed that Márton did not survive the Second World War and its after effects. For most collectors, their latest Márton postcards were dated in 1938. While the war broke out in Europe after the summer of 1939, Hungary was able to retain their traditional government until March 1944 when the Germans, Hungary's war time allies, occupied the country. The Nazis immediately started massive deportation and extermination of both Jews and eastern European refuges. Surely some of these people were friends of Márton. It took the Russian army eight months to overcome German and Hungarian forces and occupied the country. Budapest, the capital, headquarters of the Hungarian Boy Scout Association and the home of many Hungarian artists underwent a devastating 51-day siege. The first post-war jamboree, the Sixth World Jamboree, was held in France in 1947. Márton would have been 56 years old when two hundred Hungarian Scouts attended but no artwork of Márton is known from this Jamboree. By 1948, Hungary had a communist government; Scouting was banned and some of its leaders were imprisoned. Scouting would not reappear in Hungary until 1989. Márton was born on October 18, 1891, in Transylvania, than part of the old Austrian-Hungarian Empire; now part of Rumania as result of the 1920 Treaty of Trianon, which settled the First World War. Márton told an interviewer that he first started to draw at age four on the furniture and walls of his home. Jokingly, he said that he received his first rewards for his art from his father who expressed his appreciation with a stick. He studied at the College of Applied Arts (Iparmuveszeti Iskolaban). At the age of 16, in 1907, his artwork first appeared in print in the magazine Zaszlonk (Our Flag). His first public exhibit was at Christmas time 1916. A period of illness caused him to leave Budapest for the countryside until he recovered in 1920. Even at that age, Márton had patrons who furnished him a villa to recuperate. He attended the Second World Jamboree in Denmark in 1924 as part of a small 48-member team with Pal Teleki, Chief Scout of Hungary and later the country's Prime Minister. The Hungarian delegation felt that they were at first scorned by the other Scouts. Hungary was still unpopular from being on the losing side of The Great War. The Hungarian Scouts lacked funds and were therefore ill equipped. The team won several competitions, however, and finished third among the thirty-three competing national teams. Beside the Scoutcraft of the Hungarian youth, I am sure Márton and his instant artwork played an important part in winning the respect of the worldwide Scout movement. Márton said that the Jamboree was one of his most memorable experiences. 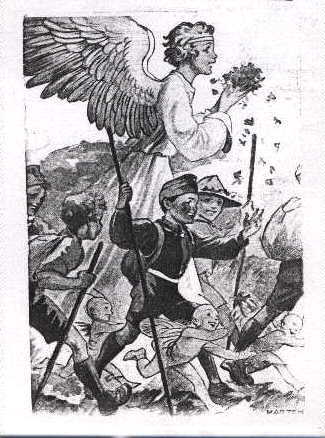 He mostly drew for Zaszlonk, a magazine produced by both the Scouts and the Roman Catholic Church for teenagers and Magyar Cserkész (Hungarian Scout). The February 15,1927 issue of Zaszlonk has a one page article on "Master Márton's Jubilee". It was part of the twentieth anniversary celebration of his drawings' first appearance in the magazine. Cincogo, a mouse-like human, was one of the earliest characters that he drew. A self-portrait of Márton and Cincogo can be found in that article. He also illustrated Toth Tihamer's youth books. 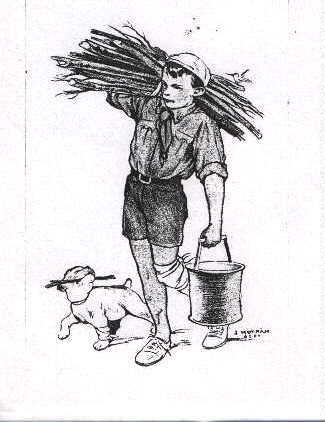 The Hungarian Boy Scout Association in 1929 issued an album of the most characteristic pencil-sketches made by Márton during several earlier international Scout gatherings. The forward of the album says "the painter Louis Márton was one of the pioneers of Scouting in Hungary and member of the Executive Committee, Hungarian Boy Scout Association". Márton also attended the Third World Jamboree in England in 1929 as one of 800 Hungarian participants. After the Jamboree, the contingent toured England and had a great time. Márton related in Zaszlonk of his thrill in meeting Archduke Fellx (Felix), a 13 year older and Archduke (feminine) Erzsebet (Elizabeth), about 5 or 6 years old, presumably of the Hapsburg (royal) family. Márton is credited with designing the symbol and badges of the Fourth World Jamboree and furnishing the artwork for its commemorative album. A two page interview was printed in a 1936 or 37 issue of Zaszlonk on his thirtieth anniversary with the magazine. It includes pictures of Márton surrounded by large size paintings. A huge painting of three and a half meters high hangs on his walls. It is titled "Krisztus Kiraly" (Christ the King). The interviewer asked about his many drawings of animals, dogs and birds. Márton responded that he did not keep animals for models but drew from memory. He said that most of his work was illustrations for magazines and books. "A lot of work but a lot of little profit" hesitated. The interviewer credits Márton with putting everything about Scouting on paper through his drawings. Although Márton was of small stature, he had a large smile and was the best known Hungarian Scout in the world at the time. In a self-portrait sketch, Márton pictured himself standing on the knees of a sitting man while carrying on a conversation. In another sketch, he shows himself with his arms folded and resting on the knees of a sitting interviewer who is bent over, looking down upon him. In the photographs published with the interview, Márton is dwarf-like when compared to the paintings in the photos. In other physical appearances, one can detect a small potbelly, a large nose, a reclining hairline and a cowlick in his hair. According to Michel's Eastern European Catalog, L. Márton was the designer of the set of stamps and souvenir sheet for the Eucharistic Congress held in Budapest in 1938. Later that year, he and his young work colleague, Kekesi Laszlo (Laszlo Kekesi), were responsible for decorating the "Aranyvonat" (Golden Train). This train carried a relic of Saint Istvan (Stephen) on a tour of the country during the celebration of the nine hundredth anniversary of the saint's death. Márton died in Budapest on January 26, 1953 and was buried. Following the fall of communism and on the centennial of his birth, in 1991, his remains were re-intern in a consecrated crypt in the Budapest Franciscan Monastery. An obituary states that Márton was an artist/painter, restorer, stamp designer, and has frescoes in nine Hungarian churches as well as paintings in the Vatican in Rome. Márton, as part of the Hungarian Boy Scout movement, help to establish it as the nation's torch of traditional values and patriotism. His work truly reflected their scout motto "A more humane man, a more Magyar Magyar". Kekesi Laszlo (1919-1993), Márton's working colleague, was a graphic artist, designer of stamps, artist painter, church painter and designer of stained glass windows. He is credited with the design of 250 Hungarian stamps and nearly 500 stamps of other countries. In Michel's catalogue, Cheeks is listed as the designer of many postage stamps with portraits of Hungarian patriots. He was acquainted with Scouting before the war and designed some postcards for the Scouts after the fall of communism. He died on April 18,1993 and was intern in the same crypt with Márton. Márton signed his cards MÁRTON L. or MÁRTON with a year date. He marked his small illustrations with just a simple M and large sketches with an unreadable signature (see his albums for an example). There are several other Hungarians artist who did scout postcards, such as Csincsura, Matis, Gyori Aranka, Kones, Velosv and Légrady. HOW DO WE COLLECT Mártons? You could try to collect all of his cards; however most collectors need to be selective when making purchases for their collection. Many collectors pick a collecting category such as unused, used, used with Scout stamps, or even used with the postage stamp removed (what a shame!). I collect Mártons with a religious element. Perhaps you might collect Mártons, which have certain animals in the scene. Or maybe you will only be able to get one or two cards. If you do, you will surely cherish your cards. Serious collectors use the word "Mártons" to describe his cards because they are both popular as well as being "signed". For example, one would say "I collect Mártons". Scouting In Hungary by Gabor Bodnar, 1986 Cleveland, Ohio USA. Although not used by this author, as it was found after the article was completed, it does contain very interesting background on the period of Márton's life. There have been a lot of people who helped me on my research for this article and I want to thank them all, especially Dr Janos Lukacs and Jozsef Bokody of the Hungarian Scout Association, Csaba Teglas, and John Ineson.